Bring about 1.5 litres of water to boil in a large saucepan. Add the lentils, reduce to a simmer and cook for about 15 minutes, or until lentils are just tender. Drain and set aside. Heat 1 Tablespoon of the oil in a heavy-based casserole dish (that can be used on the stove-top and in the oven) on the stove and cook the eggplant and zucchini until golden, in batches. Remove and set aside. If you don’t have a dish that can be used for both stove and oven cooking, use a pan and transfer to an oven dish in the next step. While you are cooking the eggplant and zucchini, remove the seeds from the pomegranate. An easy way to do this is cut the pomegranate in half (not through the crown). Hold the cut edge in your hand, with your palm facing, over a bowl and use a wooden spoon to very firmly hit the pomegranate. The seeds should begin to drop out. Be sure to pick out any of the white bits because they are bitter. You only want the seeds. Preheat the oven to 180C or 160 fan-forced. Add another 1 Tablespoon of oil to the casserole dish and cook the onion for 5 minutes. Add the garlic and cook a further 3 minutes. Add the tomatoes and heat through. Leave in the casserole dish, or transfer to an oven-safe dish if you need to. On top of the tomato and onion mixture, sprinkle some pomegranate seeds, then layer half of the eggplant and zucchini. Spoon half of the lentils on top. 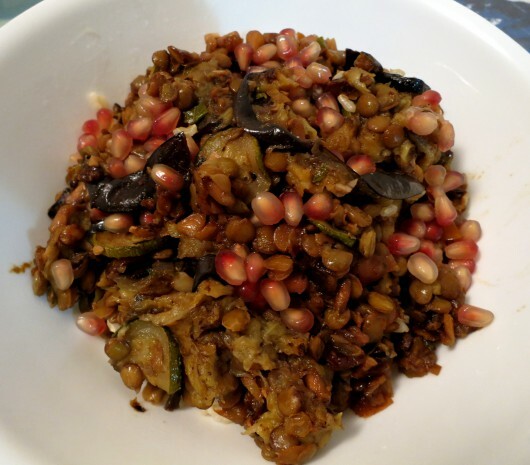 Repeat with a little more pomegranate seeds and the remaining eggplant, zucchini and lentils. Drizzle with the final Tablespoon of oil. Cover and cook in the preheated over for 1 hour. Serve warm with a final sprinkle of pomegranate seeds and the parsley to garnish.